The TruePower 199 is small at only 3 inches, but this doesn’t have to be a negative thing. Since it is small you can use it pretty much anywhere and the motor inside the housing is still strong. The motor runs at 150W and rated for 110 volts which is a pretty good amount. The wheels can spin from 0 to 10000 rpm when not under load which is exceptional. Now, these wheels are smaller than your standard bench grinder, so that is why it spins faster, but still they have plenty of power for basic jobs. Also, the fact that it has a variable speed control is a nice bonus. The variable speed knob is located right on the front so it is easy to set the speed while working. The benefits of having a bench grinder with variable speed means you can slow it down and relay less on the pressure you are using. If you are new to bench grinders, then this is really handy because you may not have mastered working by feel yet. The wheel housing is durable and provides protection from sparks going everywhere while still providing plenty of room to work. Also, there is an eye shield included that you can attach to add extra protection for your face. The eye shield goes over top the wheel house opening and is raised so you can easily get the material under it that you are working on. You can also attach the tool rest that it comes with you make it easier to get the perfect angle on whatever you are working on. This bench grinder is great for small task like sharpening drill bits, so having a tool rest to rest them on makes it easy to get the perfect tip. The TruePower 199 is also one of the best bench grinders because it comes with lots of extra attachments. It comes with a flex shaft to make it easier to mount different things to it. It also comes with a stone bit to use on a variety of jobs. It even comes with a collet wrench and hex wrench to make changing things easy and it helps you to be able to set the bench grinder up right out of the box by just following the directions in the manual. It even comes with a grinding wheel and polishing wheel which are both three inches so you can start working right away. On top of all the extra bonuses that this bench grinder comes with most customers really love it and the most important part of a bench grinder review is real customer’s opinions. They like that it is budget friendly and small which makes it easy to use. On Amazon it has over 50 reviews and a four star rating. This should let you know that it is a good product and over all people are satisfied with it. When buying this bench grinder you got to be realistic about all it can do. It is small and some customers have complained it is not heavy duty enough. This doesn’t mean that this is a bad bench grinder. It just means it wasn’t the best bench grinder for them. The customers that this was the best bench grinder for them really love the small size. It doesn’t vibrate a lot and can be used without even mounting to a work bench if you want to. The TruePower 199 bench grinder is a great one for putting tips on drill bits and sharpening small tools like knives. Another use for this bench grinder that people love is the jewelry uses it provides. If you are a gem cutter then this is great for putting facets onto stones. It is also great for polishing stones. You can even use it to polish metal bands. This small three inch bench grinder really is multipurpose and the jobs that you can do with it are not limited. You just have to make sure that the jobs are small ones. People also love the fact that by buying on Amazon it is convenient. The bench grinder gets delivered straight to your home and you don’t have to go out hunting for it. Also, Amazon offers a great return policy so if you decide you need a bigger bench grinder it isn’t hard to return the product. One other issue some people had was the speed knob or small parts breaking off. If this happens you can return it and get a model that was made correctly. Is The TruePower 199 Mini Multi Purpose Bench Grinder right for you? The TruePower 199 is a great small bench grinder. It might be the best bench grinder for you if you are doing small task like sharpening tools or putting points on drill bits. It could also be good for you if you want a more mobile work area since you don’t have to mount this grinder on a bench. It doesn’t vibrate much and can be used not mounted so you can move it around. 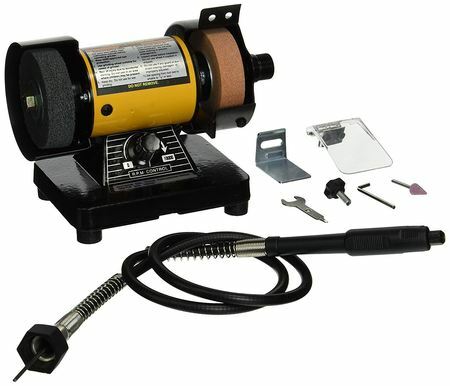 This bench grinder is really great if you are doing precision things such as making jewelry. It is also awesome that this bench grinder comes with all the features of a bigger and costlier one without the high cost.